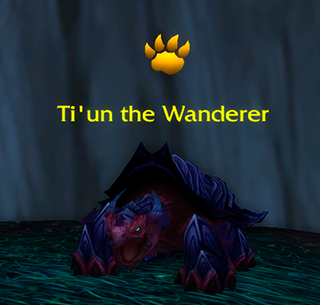 This is the Beasts of Fable Book 3 Legendary Ti'un the Wanderer. The quest can be picked up from Gentle Sans, located in the Shrine of the Two Moons at 60,23. For this Encounter were going to use : I prefer three s/s Ravens, but it can vary. Any crow/raven combination will work. We have the speed advantage here, so lets get to work. Start by dropping darkness. This is going to do some damage and set him up for nocturnal strike. Ti'un will usualy start with His shell shield, but sometimes you can get lucky and he doesnt cast it a single time. He cycles thru Tidal Wave, Pump and Shell shield. This fight is just about keeping Darkness and Nocturnal strike on CD, and spamming alpha strike. His pump will usualy one shot a Raven, so just keep the pressure on. When one Raven goes down, cycle in another and keep chaining the darness with Noctuurnal Strikes. Turtle soup is in your future!